For the blogging world its a breaking news of course not for all!because I have made every one out there to believe that Iam a pure vegetarian(not put non vegetarian recipes in my blog till date)One of my dear friend Padma priya who reads my blog regularly used to ask why you are not posting non-vegetarian dishes till now?Really till now I have never declared(I myself don’t know the reason)even to myself the reason for not putting non-vegetarian recipes in my space. But this time when I did this strawberry cupcakes with eggs I clicked the step wise pictures just like that and it was for my hubby’s birthday.When it turned out with a pretty look and taste I was tempted to take final pictures.Long time was thinking to try strawberry cupcakes as I have already tried halwa with these strawberries!both are and will be kids favorite for sure.While adding flour only fold it don’t beat it with a beater and even while mixing butter and sugar cream it at high-speed for five minutes so that the color of the butter changes from yellow to white.I have tried this recipe from Martha stewards blog and they have used four eggs for given flour measurement but I have used only two which also have tuned out pretty good and nice.Not to mention I have made minor changes from the yummilicious original recipe. 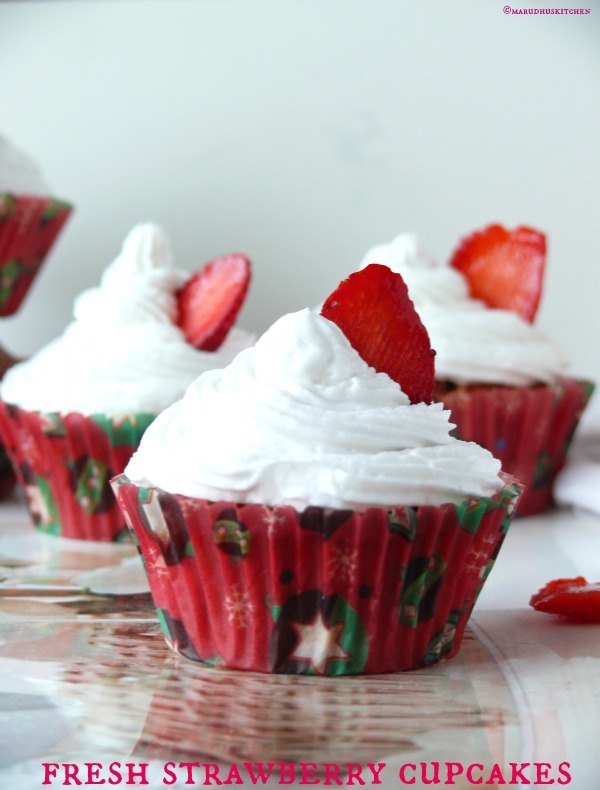 Fresh strawberries – 1/2 cup(chopped),vanilla essence – 1 tsp for cake. 1.Take a mixer jar puree strawberries with milk ,vanilla essence and keep ready and line the cupcake or muffin tray with paper cups. 2.Sift maida,baking powder and salt and keep ready. 3.Take a bowl with sugar and butter beat for 5 minutes till creamy at high speed. 4.Now reduce speed and add egg one after other,beat well till nicely combined. 5.In between preheat oven at 180 degrees for 10 minutes. 7.Now add flour little at a time by only folding not by beating. 8.Fold till combined transfer to cupcake molds. 9.Bake for 20 -25 minutes depending upon your ovens nature. 10.Prick with a skewer and check for done-ness. 11.You can bake this as cakes using baking tray also. 12.Now after baking cool the cupcakes. 1.Chill your bowl,contents,beating handle for some time then make frosting. 2.Now cream the whipped cream with 6 tbsp of water ,1 tbsp sugar and vanilla essence till fluffy and airy. 3.Cream /top it using piping bag. Looks yummy. Love the topping. Great presentation. Haha so true. Even I for long thought only me and Pama were the two carnivores in The Culinary Hoppers. Belated Happy Birthday to your Hubby. 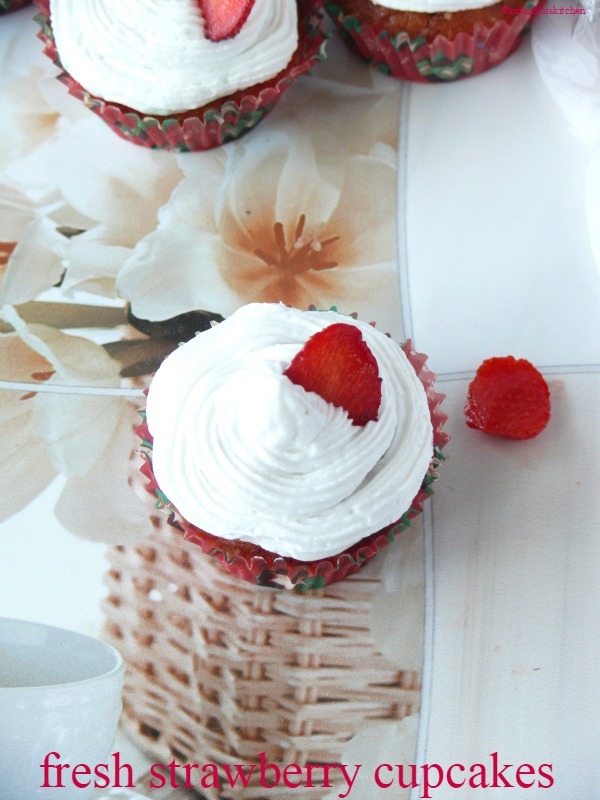 The strawberry cup cakes look befitting for the celebrations accentuated by a gorgeous topping. I am wondering if they look so droolicious, how awesome they must have tasted. OOps… Sorry There was a typographical error in Padma’s name above. Unable to edit or remove.